A NASA spacecraft watching the sun has caught a dazzling view of a solar eruption that launched a vast tendril of magnetic plasma into space. NASA's Solar Dynamics Observatory recorded the sun tentacle, which scientists call a solar prominence, on March 19 as it erupted into space with a rounded, twisting motion. Ultimately, the sun filament lost cohesion and its particles streamed away from the sun. "Prominences are elongated clouds of plasma that hover above the sun's surface, tethered by magnetic forces," SDO mission scientists explained. Earlier this month, the sun unleashed its second X-class solar flare of the year that was aimed at Earth. X-class solar flares are the strongest types of solar flares. The weakest types of solar flares are Class C sun storms, with Class M flares registering as medium strength, but still powerful, NASA scientists have said. 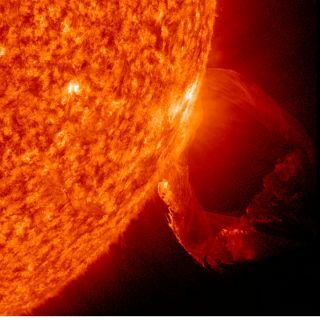 Strong solar flares, when aimed at Earth, can potentially disrupt satellites and power grids, as well as pose a hazard to astronauts on spacecraft. They can also spark dazzling shows of the northern lights, or aurora borealis.